Adda52 – India’s No. 1 Poker Site continues to excite poker players with something new and different each time. Recently, they came up with the 1 Crore GTD National Poker Championship (NPC), now they have made another enticing announcement – ‘The Game of Thrills’, a brand new cash game promotion where poker players can enroll for Free and win upto a hefty 20 Lac in prizemoney. In its quest to optimize the experience for players, Adda52 has been the pioneer in introducing exciting leaderboard races with huge prizes. Raising the bar, now the company has come up with the ‘Game of Thrills’, a mid & high stakes cash game leaderboard running from 14th to 28th April and culminating on 30th April with 2 hour ‘Game of Thrills’ finale for top 16 with 20 Lac in prize money. This unique leaderboard has been divided into two broad categories – the ‘12 Lac Heavy Weight Leaderboard at 200/400 & above blinds’ and the ‘8 Lac Light Weight Leaderboard at 25/50 to 100/200 blinds’. Top 16 players from each leaderboard will enter one of the 4 powerful houses – Sharks, Marshal, Lancer and Tarzan, in a group of 8 each to play the ‘Game of Thrills’ on 30th April, which starts at 8 pm and lasts for 2 hours. At the end of the game, your final stack left at the end of the game will be credited with instant bonus as winning prize. For instance, if you are left with a 3 Lac stack, your account will be credited with 3 Lac Instant Bonus as your winning prizemoney. 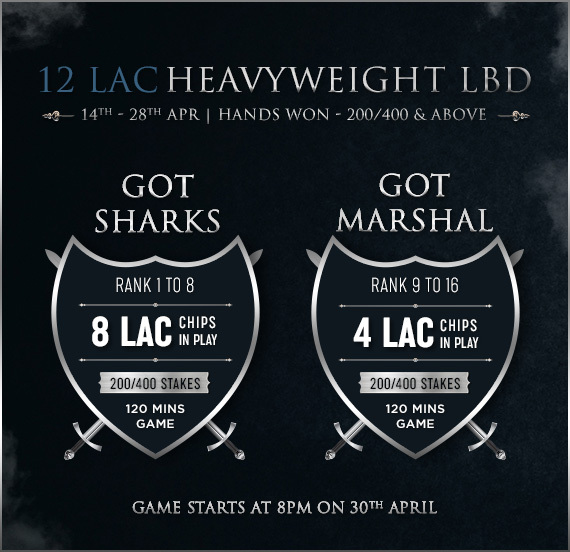 To play the ‘ Game of Thrills’ finale on 30th April, players who win hands at 200-400 & above blinds from 14th to 28th April and rank between 1st to 8th places on the 12 Lac Heavy Weight Leaderboard will enter ‘Got Sharks’ and they will be distributed from 8 Lac chips in play evenly. Those who win hands at 200-400 & above blinds from 14th to 28th April but fall between 9th to 16th positions on the leaderboard will join ‘Got Marshal’ and they will be distributed from 4 Lac chips in play evenly. 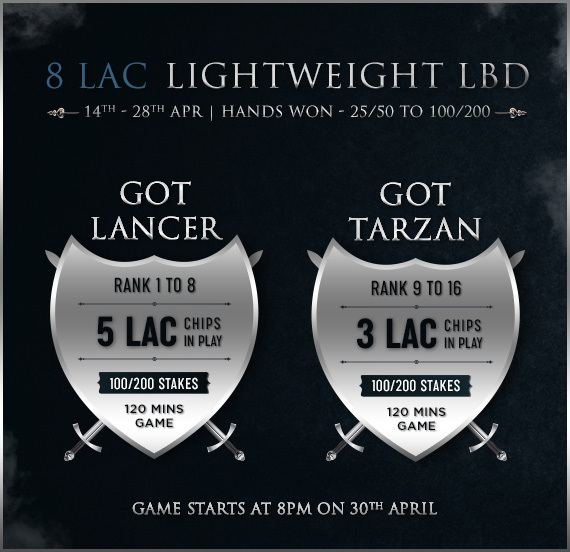 On the other hand, players who win hands at 25/50 to 100/200 blinds between 14th to 28th April and rank between 1st to 8th places on the 8 Lac Lightweight Leaderboard will enter ‘Got Lancer’ on 30th April to play ‘Game of Thrills’. They will be distributed from 5 Lac chips in play. Those who win hands at 25/50 to 100/200 blinds between 14th to 28th April but fall between 9th to 16th ranks on the leaderboard will enter ‘Got Tarzan’ and they will be distributed from 3 Lac chips in play. The ‘Game of Thrills’ on 30th April will start at 8 pm and it will last for 120 minutes. Your account will be credited with instant bonus as winning prizes in proportion to your stacks left at the end of game. So, enter this exclusive cash game promotion on Adda52 from 14th to 28th April and win upto 20 Lac! For the additional details on the ‘Game of Thrills’ on Adda52.com, check out this link HERE!